Liverpool got back to winning ways after a comfortable 5-0 victory over Watford at Anfield in a Premier League match. It did not take long for Jurgen Klopp's side to get into the lead as danger man Mohammed Salah made it one for the Reds courtesy of an assist from Sadio Mane after just four minutes. Two minutes before half time it was the Premier League top scorer again who made it 2-0 after the he benefited from a Robertsons' cross as he side foots the ball home. 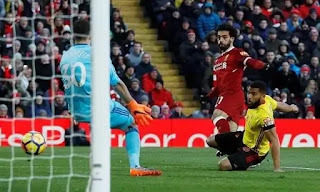 Goal scorer turns provider as Salah found teammate Roberto Firmino who scored Liverpool's third to extend their lead for the side that were beaten by Jose Mourinho's Manchester United at Old Trafford.